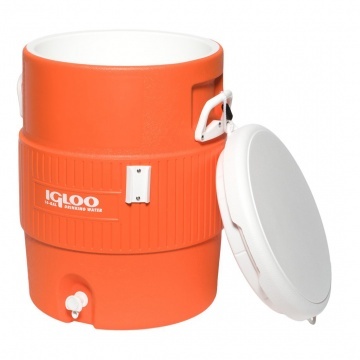 Igloo 10 Gallon Seat Top Water Jug with Cup Dispenser drinks cooler uses Ultratherm® insulation in body and lid for maximum cold retention and push-button spigot enables easy leak free dispensing. The Igloo 10 Gallon 37.5 Litre Water Jug keeps water cold longer and is ideal for hydrating the entire sports team or work force. 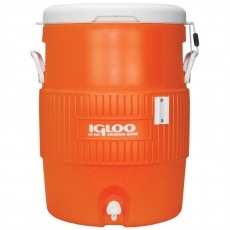 Large 10 gallon 37.5 litre capacity water jug. Easy clean no spill pressure fit seat top lid. Pressure fit lid won't trap dirt or mould. Handy side fit cup dispenser. 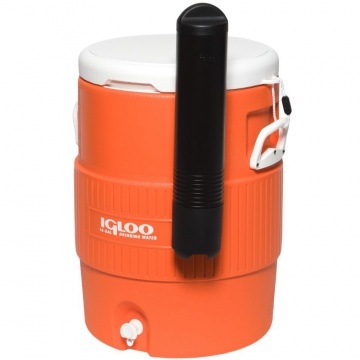 In test conditions when filled with ice the ice can remain frozen for 3 1/2 days at 30°C. Meets OSHA "Drinking Water" labelling requirements for water used at work sites. 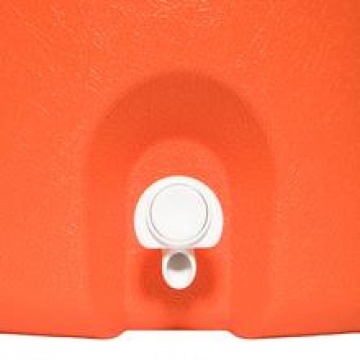 Recessed and angled drip resistant spigot for easy dispensing. Cord tether keeps lid from getting lost or dirty. Front push button spigot is easy to access when wearing gloves at the work site. Inches: 17.25" x 15.81" x 22.13"
Top: 19.13" x 19.13" x 19.13"
Bottom: 12.5" x 12.5" x 19.13"